Stephen Bilkis & Associates is a New York law firm focused on helping people who have been injured in trucking accidents. 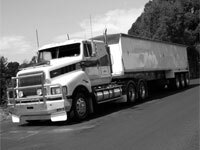 Truck accidents can cause serious injuries both because of the size and weight of commercial trucks as well as the hazardous cargo that some trucks transport. Drivers, passengers and pedestrians struck by semi-tractor trailers, 18-wheelers and other large commercial trucks face catastrophic spinal and brain injuries, broken bones, and severe heat or chemical burns. Unfortunately, trucking-related injuries occur much too frequently: statistics show that trucks are involved in one-in-nine traffic accidents. In almost every case, the occupants of other vehicles suffered serious injuries or death. Many factors cause trucking accidents. Some of these are driver-related, such as when a truck driver operates the truck at excessive speeds or drives recklessly to meet a tight delivery schedule. Other times, the shipping company may have improperly loaded the truck or improperly secured the hazardous cargo. If a truck has injured you or killed your loved one in New York, you must protect your interests immediately. New York has very strict statutes of limitations on personal injury claims. Stephen Bilkis & Associates will make sure you are protected and you obtain the full damage award you are entitled. Stephen Bilkis & Associates is a New York trucking injury law firm. Contact us at 800.696.9529 to complete our online contact form to set-up a free no-obligation consultation.